Salter tosses and gores Australia’s little—but influential and dismayingly respectable—clique of open-borders libertarians, using arguments that will be familiar to VDARE.com readers. He rounds off the essay with some blunt facts. The only population difference between the immigration levels adopted by succeeding governments over recent decades and open borders is the date at which the country becomes overcrowded. In addition ethnic stratification is growing. Most Aboriginal Australians remain an economic underclass and some immigrant communities show high levels of long-term unemployment. Anglo Australians, still about 70 percent of the population, are presently being displaced disproportionately in the professions and in senior managerial positions by Asian immigrants and their children. The solution, he believes, is to break the stranglehold of ideology on university departments of humanities and social sciences. sometimes [adopting] a hostile attitude towards Anglo and white Australia but not towards minorities … Abuse of Anglo Australia is common. The asymmetry in pecks and the identity and institutional affiliations of the peckers indicates that Australia has an ethnic hierarchy in which Anglos are firmly underneath and an alliance of leftist intellectuals and minorities are firmly on top. The examples also indicate that the hierarchy is not the natural order of things but is maintained through soft totalitarianism, known euphemistically as “political correctness”, consisting of intolerance on the part of the elite media, lack of political alternatives, and intimidation both informal and formal delivered by a growingly authoritarian and openly anti-Anglo immigration industry. In Salter’s analysis, this disconnect has happened because beginning in the 1950s Anglo elites “were stepping away from their traditional role of national leadership.” In other words, the critical step was the emergence of a hostile elite that viewed the traditional people and culture of Australia as backward and worthy of displacement. The thesis of The Culture of Critique is that Jewish intellectuals with access to prestigious universities combined with Jewish media influence were a critical component (necessary condition) of the emergence and dominance of this new elite. The present Labor government is intent on introducing a national civics curriculum for schools that teaches children nothing of the country’s Anglo-Celtic and European history. Instead it intends to emphasise Aboriginal culture, Asian geography, environmental sustainability and leftist values. … Australia’s own English and European political traditions are not mentioned in the draft curriculum; neither is individual liberty. And as the Australian Christian Lobby argues, there is no justification for ignoring Western biblical traditions. As in America and throughout the West, non-Whites have become critical components of electoral coalitions of the left and strong advocates of continued non-White immigration. In the U.S., Barack Obama owes his election to the fact that 80% of non-Whites voted Democrat, and he is actively pursuing “comprehensive immigration reform” that will further fuel the non-White coalition that has coalesced in the Democratic Party. In France, Muslims decided the last presidential election in favor of François Hollande, voting 93-7 for the Socialist candidate. Similarly, a conservative Australian politician, John Howard, was defeated by Asian votes because 20 years earlier he had expressed reservations about Asian immigration during a time of economic recession. Race trumped class. More significantly, the commentariat did not hurl accusations of racism at the Labor Party or ethnically-motivated voters. Instead they commended the tactics used. It seems that anti-racism sometimes means anti-white. … A similar double standard prevents the Greens from opposing mass immigration, which overnight transforms low-polluting Third Worlders into the highest polluters on the planet. In a way, race trumps the environment. The subordination and steady replacement of Anglo Australia is not due to high principle but an unholy Left-minority alliance. The cosmopolitan Left has abandoned the shrinking white blue-collar working class for new constituencies, including minority ethnics who can be relied upon to vote for parties that keep the immigration door open to ethnic kin. Australia’s cosmopolitan elites are, in effect, electing a new people to replace reactionary Anglo Australia. The fact that the new people are more ethnically motivated than Anglo Australians has not bothered ideologues who are on hair-trigger alert for any hint of Anglo ethnic sentiment. Indirect evidence that the ghost of Franz Boas still haunts the antipodean ivory tower comes from leading scholars of ethnicity and nationalism who I contacted. They could not name one Australian scholar who professes biosocial theory. … No political science or sociology department reported a scholar basing his or her research or teaching on behavioural biology. The skew towards Marxist and other environmental theories means that scholars of nationality do not know what to do with the wealth of findings drawn from evolutionary psychology, ethology, and sociobiology—except ignore them. Anglo racism and privilege, and immigrant victimhood, are treated as axiomatic. For example, the “new racism” is held to be a distinctively Anglo view of the nation as assimilationist, ethnocultural, or egalitarian, a narrow conception at odds with the civic nationalism on which multiculturalism is based. Egalitarian images of Australia are a form of Anglo racism, it is argued, because they deny the supposed reality of Anglo privilege. The result of the left’s addiction to the proposition nation rather than nations built on an ethnic core is “the fantasy that manipulation of Australia’s national historical narrative can produce something that has never existed, a diverse ethno-nation possessing the same benefits of social cohesion, social capital and allegiance that accrue to real nations.” Not only has such a nation never existed, all the research indicates that proposition nations with a high degree of multiculturalism have less social capital, more conflict, and a greater sense of alienation than nations built on ethnic core. Yet, as Salter notes, the academics who come up with these ideas are richly rewarded with prestigious university positions and best-selling, lavishly praised books. Salter highlights an early forerunner to the idea that Whites have no legitimate ethnic interests, E. Digby Baltzell’s classic denunciation of WASP ethnicity, The Protestant Establishment: Aristocracy and Caste in America (1964). Baltzell treated Anglos as possessing no legitimate interests that might be threatened by other ethnic groups and thus by mass immigration. He clinically examined Anglo-Americans, and only Anglo-Americans, for any sign of ethnic solidarity, inevitably finding symptoms which he promptly diagnosed as immoral. He treated immigrant communities very differently, as possessing legitimate interests that are often threatened by Anglo racism but which would be wholly benign if realised. In this perspective minorities harbour no competitive ethnic sentiments, a most improbable exception from human nature. Anglo Australians are a subaltern ethnicity. They are second-class citizens, the only ethnic group subjected to gratuitous defamation and hostile interrogation in the quality media, academia and race-relations bureaucracy. The national question is obscured in political culture by fallout from a continuing culture war against the historical Australian nation. Many of the premises on which ethnic policy have been based since the 1970s are simply false, from the beneficence of diversity to the white monopoly of racism and the irrelevance of race. The elite media and strong elements of the professoriate assert that racial hatred in Australia is the product of Anglo-Celtic society. But in the same media and even in the Commission for Race Discrimination most ethnic disparagement is aimed at “homogenised white” people. One or more Anglo councils are needed, non-governmental organisations along the lines of other ethnic councils but oriented more towards promoting the scientific study of ethnicity and nationalism. The council should also advocate for Anglo Australians, broadly defined. An Anglo council, and ultimately a federation of Anglo councils, would defend its constituents’ ethnic interests—against defamation, exploitation and demographic swamping. It would demand full representation in multicultural bodies and seek consultative access to government. It would lobby for schoolchildren to be taught the true history of the nation. It would affirm its attachment to the land of Australia. And it would insist that if any people is to be recognised in the Constitution, pride of place should be given to that which founded the nation and provided its infrastructure, political and legal systems, culture and language. Representing the core national identity and the majority of Australians, such a council should adopt a conciliatory role to smooth ethnic relations but in a manner compatible with defending its constituents’ rights and legitimate interests. The effect would be to democratise multiculturalism and the immigration industry by giving the majority of Australians representation in those spheres for the first time. This is a very sensible suggestion, sure to be met with all the fury and economic power of the multicultural industry, particularly non-White ethnic activist organizations. Charges of “racism” would be only the beginning. 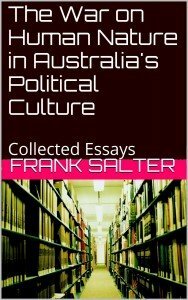 But the good news is that Salter’s essay was published in a mainstream conservative journal in Australia. This is a very important development because it gives nationalists the intellectual firepower they need to confidently meet the arguments proposed by self-serving multicultists. Salter’s analysis clearly implies that the unfolding disaster of White dispossession could not have occurred without the dominance of the left in the universities and the media. The fact that Quadrant was willing to publish this work by a highly qualified academic in a mainstream conservative publication is a huge blow in the opposite direction. If even one Western nation, such as Australia, turned away from its current path of self-destruction and suicide by asserting the legitimate ethnic interests of Whites, there would be a powerful ripple effect throughout the West. And that would be revolutionary.